Eggs are incubated for 5 weeks by both parents. Usually 2 – 3 eggs are laid at almost any time of the year. It is not common for all offspring to survive. African penguins have one mate for several breeding seasons and even up to 10 years. The coast and islands of Southwestern Africa, in Namibia and South Africa. Coastlines. Spend most of day in water and cool nights on land. Eat mainly sardines but also squid, anchovies and other small animals. There are white patches ventrally and laterally on the cranium, as well as a ventral white patch on the body. There is a black horseshoe-shaped band running around their chest, and they also have a horseshoe-shaped white band that goes around the eye from the chin towards the beak. African penguins live in a much warmer environment than Antartic penguins, with mean low temperatures of 6ºC (43ºF). African penguins can remain under water 14 seconds for every second that they spend taking a breath and can dive to depths of 427 feet. 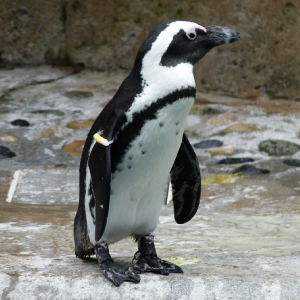 Download our African Penguin Conservation booklet!